Statements of mutual appreciation are never far from centre stage at an Australia-United States Ministerial Consultations (AUSMIN) meeting. In 2002, both sides agreed that the meeting came at a time “when the bilateral security alliance [between the United States and Australia] had never been stronger”, and this sentiment has been repeated in various ways at each of the meetings in the years since. The statements made at the sixtieth-anniversary of the ANZUS alliance commemorated at last year’s AUSMIN were particularly emotive, with both Australia and the U.S. pointing to their shared military sacrifices, democratic values, influence and interests in the Asia Pacific region, and common strategic objectives. With the 2012 AUSMIN conference fast approaching, we decided to take a look at the language that has dominated at least the public face of AUSMIN over the past decade. From its beginnings in 1985, the annual meeting has provided an insight into the joint concerns of both Australia and the United States. 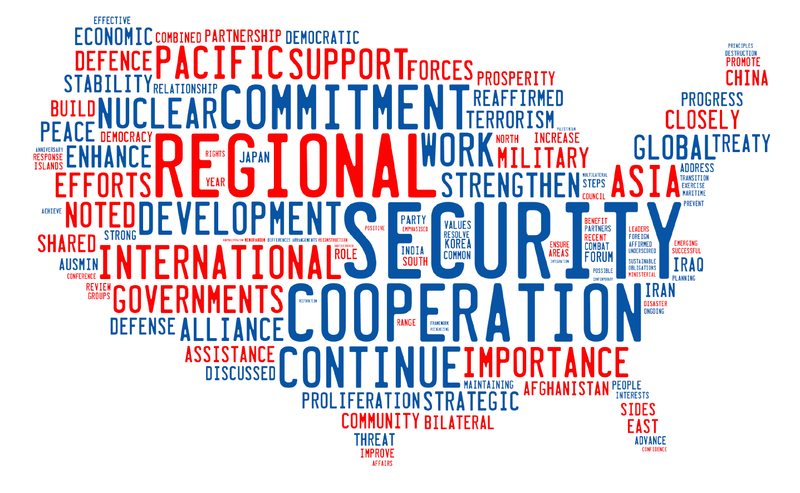 As we can see from the word cloud above—constructed from the public communiques issued at the end of each meeting—the language has been dominated by ‘soft’ terms such as ‘cooperation’, ‘security’ and ‘commitment’, at the bilateral, global and regional level. Conversely, despite the rhetorical importance placed upon shared sacrifices, the two major theatres where Australian and American forces have been engaged—Iraq and Afghanistan—are relatively inconspicuous. AUSMIN communiqués always use polite diplomatic language, but there are subtle differences in the implications of the words used. ‘Welcoming’, for example, is akin to a pat on the shoulder for an action taken whereas ‘agreed’ suggests that both sides will take joint-action to achieve an objective. In the context of the war in Afghanistan and later Iraq, the use of the term ‘agreed’ increasingly replaced the term ‘welcomed’ in matters of defence. This is perhaps unsurprising as cooperation between the two countries became a key talking point after Australia invoked the mutual security provisions of the ANZUS Treaty to justify involvement in Afghanistan. Fighting two wars together, the U.S. and Australia ‘agreed’ to establish joint-training exercises and greater military cooperation. In the middle of the decade, this joint-involvement grew in complexity as both states agreed to greater intelligence and defence capability sharing, as evidenced by Australia and the U.S. signing the Satellite Communication Statement of Principles. This trend towards greater strategic interoperability is likely to be reinforced with an increased U.S. military presence in Australia and a greater focus from both states on the Asia Pacific region. So while Afghanistan and Iraq may not command a great deal of space in the word cloud, these two wars have had a significant influence in shaping interoperability between the U.S. and Australia. Clearly then, it isn’t always the frequency of the words that are important; we must also consider the context they are placed in, and the outcomes they create. What these outcomes reveal is an evolution in the Australia-U.S. relationship. In the latter half of the decade, as the global war on terror made a slight retreat from the front-line of shared foreign policy, humanitarian concerns and potential new threats began to join the top ranks of security issues. This was fully realised in 2011, when ‘interoperability’ was placed under the broader umbrella of ‘strengthening the alliance cooperation’. The 2011 Joint-Communique proclaimed that the alliance between the two nations, strengthened over the last decade, could serve as a “strategic anchor for peace and stability in the Asia-Pacific and beyond.” Sea, space and cyberspace joined the well-established concerns over missile and WMD proliferation as the strategic anchor was lowered into the waters of non-traditional security. With the Joint Statement on Cyberspace, the 2011 AUSMIN conference heralded a new era in the ANZUS Treaty. What this will mean in practical terms remains unclear (see ASPI ANZUS 2.0). AUSMIN’s evolution can also be seen in the way in which the geographical backdrop of the discussions has been portrayed. The beginning of the decade saw the majority of the Asia Pacific states subsumed within the broader framework of the global war on terror, with some notable exceptions. By the 2011 Joint Communique, the new framework of security in the Asia Pacific demanded that individual states be given more in-depth commentary. China, as one of the key drivers in shaping the Asia Pacific region, has seen the most interesting evolution in the commentary of a single state. In the early years of the millennium, references to China were generally framed within the context of its relationship with Taiwan or its role in facilitating the Six Party Talks. As the decade progressed these points were replaced with more nuanced discussions of China’s role in the international system. Calls for further transparency in China’s military modernisation, and the establishment of substantive discussions on capabilities and strategic security issues began to characterise AUSMIN’s take on China in the latter half of the decade. The dynamic nature of the alliance between Australia and the US means that a future word cloud will very likely look different to that shown above. The ‘feel good’ terms will always dominate the central space. But, as the Asia Pacific continues to grow and expand and security issues continue to evolve, the names of individual states in the Asia Pacific region and words such as ‘cyber’ will continue to expand and others will diminish or disappear. How these words are used will determine the significance of these new trends for the Australia-U.S. alliance. Mary Willett and Chris Louie are currently undertaking ASPI’s internship program. Image produced using Tagxedo  software.